In this article we will show you how to apply different filters on your RowGroupDescriptions and ColumnGroupDescriptions. The Data in RadPivotGrid can be filtered based on several conditions to give you a view on specific details or just to make the report shorter. There are three types of filters you may use on your RowGroupDescriptions/ColumnGroupDescriptions. Top 10 filter - filters the report based on one of the aggregates used, but shows top/bottom results of applied filter. is greater than - show only groups which header is greater than the parameter we pass. Note that you should put in the whole header value which has to be matched. For example if you have headers "Data1", "Data2", "Data3" and you set this condition with parameter "Data1" you will see only "Data2" and "Data3" in RadPivotGrid, but if you set the parameter of the condition to "Data" then all of the groups will show as all of them are greater than "Data" by string comparison. is greater than or equal to - showing only groups which header is greater or equal of the parameter we pass. is less than - show only groups which header is smaller than the parameter we pass. is less than or equal to - showing only groups which header is smaller is or equal of the parameter we pass. Note that the full header text has to match in order to apply the equal comparison. begins with - showing only groups which header starts with the parameter we pass. does not begin with - showing only groups which header does NOT start with the parameter we pass. ends with - showing only groups which header ends with the parameter we pass. does not end with - showing only groups which header does NOT end with the parameter we pass. is between - showing only groups which header is between the two parameters we pass. is not between - showing only groups which header is NOT between the two parameters we pass. All conditions are case sensitive and are using string comparison between the headers of the groups and the passed parameters. SetCondition - used when you want to show only particular items that include/does not include particular items defined in the Items property based on the Comparison property. TextCondition - used when you want to filter the data based on a string value defined in Pattern property. 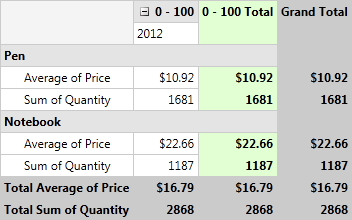 The Comparison property gives different options for the comparison method. ItemsFilterCondition - used when you want to apply to conditions simultaneously (it is mandatory one of them to be SetCondition). ItemsFilterCondition has property Condition where you can set an instance of Comparison, Interval or Text condtions. The property DistinctCondition needs an instance of SetCondition. This way the only visible item will be Pencil as it is part of the SetCondition and also has "c" in its name which satisfies the text condition. equals - showing only groups which header fully matches the parameter we pass. is greater than - show only groups which header is greater than the parameter we pass. is less than or equal to - showing only groups which header is smaller is or equal of the parameter we pass. So if we apply a Value Filter on the Name RowGroupDescription from the GettingStarted article, set condition "is greater than" and pass as parameter value 10 we will notice that one of the items is missing because its GrandTotal is less than 10. Top 10 filter is used when you want to show only the top/bottom items based on some criteria. The criteria is one of the Aggregate Descriptions used in the application. You can show the exact count of top/bottom items to show based on the selected aggregate description, the top items which sum is near the one you set as parameter or the top/bottom items which sum presents percent of the GrandTotal (you choose the percent). You can define Top 10 filter in the XAML, in the code behind or at runtime by using RadPivotFieldList. When defining this filter you have to note that PropertyGroupDescription, DoubleGroupDescription and DateTimeGroupDescription all have GroupFilter property. To apply Top 10 filter you can set as GroupFilter any of the following: GroupsCountFilter, GroupsPercentFilter, GroupsSumFilter. 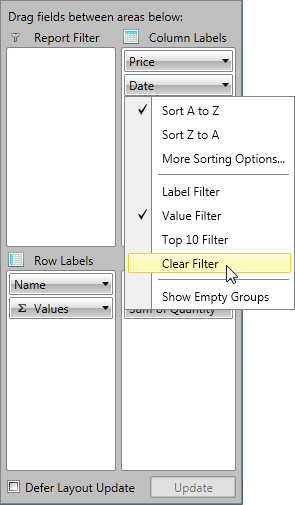 GroupsCountFilter - selects a specific number of groups sorted by a given criteria. It is important to define the Count property which indicates the number of groups that will be shown, Selection property, which defines if the Top or Bottom groups will be shown and AggregateIndex property which defines which Aggregate Description will be used for the filter. GroupsPercentFilter - selects groups until the sum of their aggregates reaches a given percent of their total. 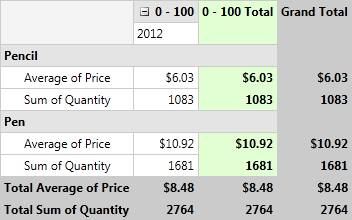 It is important to define the Percent property which indicates the percentage of GrandTotal that selected groups should reach, Selection property, which defines if the Top or Bottom groups will be shown and AggregateIndex property which defines which Aggregate Description will be used for the filter. The Percent property is of type double. 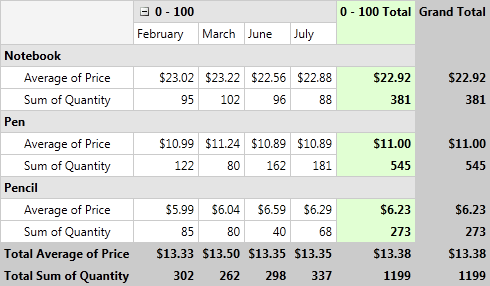 If you define value higher than 1.00 it will represent it as 100%. 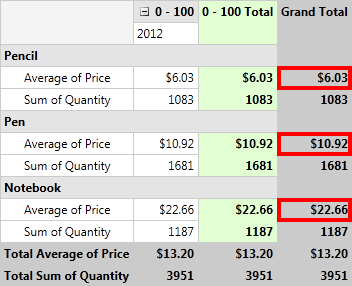 GroupsSumFilter - selects from the groups until sum of their GrandTotals reaches a given number. It is important to define the Sum property which indicates the Sum of GrandTotal that selected groups should reach, Selection property, which defines if the Top or Bottom groups will be shown and AggregateIndex property which defines which Aggregate Description will be used for the filter.